Darden Restaurants Inc., DRI +1.26% owner of Olive Garden, LongHorn Steakhouse and Red Lobster, has long included automatic 18% tips on the bill for parties of eight or more at its more than 2,100 restaurants, but is experimenting with eliminating them because of the IRS ruling, said a spokesman. The chain in July stopped automatic tips at 100 restaurants in four cities, where it is testing a new system in which the restaurants include three suggested tip amounts, calculating for the customer the total with a 15%, 18% or 20% tip on all bills, regardless of party size. Diners can opt to tip more or less than the suggested amounts, or to not tip. Depending on how patrons react and how well the new software system works, Darden may switch to such suggested tips at all of its restaurants. A spokesman said the company will decide by year-end. Texas Roadhouse Inc., which includes a tip of 15% for parties of eight or more at many of its more than 390 restaurants, is planning to phase out automatic gratuities by the end of the year, a spokesman said. “I think the vast majority of restaurant owners will discontinue the practice,” says Denise Wheeler, an employment attorney in Fort Myers, Fla., who represents several restaurant chains. The change will complicate payroll accounting for restaurants that stick with automatic tips, because they will need to factor those tips into pay, meaning hourly pay rates—could vary day to day depending on how many large parties are served. Restaurants are required to report to the IRS what its employees report receiving for tips and to pay Medicare and Social Security taxes on those amounts. Restaurants are eligible for an income-tax credit for some or all of those payments, but service charges aren’t eligible, according to Marianna Dyson, a payroll tax attorney in Washington, D.C., who represents restaurant chains. The change comes amid increasing costs and record-keeping requirements for restaurants. In January, restaurants with 50 or more full-time workers will be required to offer health coverage to employees working 30 or more hours a week, though penalties don’t begin until 2015. Restaurants adopted automatic gratuities to help ensure that their servers—whose tips supplement a salary that is often less than the federal minimum wage of $7.25 an hour—weren’t stiffed on large tabs. But many servers are likely to support dropping the practice because they don’t like the idea of their tips being treated as wages, which requires upfront withholding of federal taxes, and means they won’t see that tip money until payday. “I don’t want my tips to be on my paycheck as a wage. 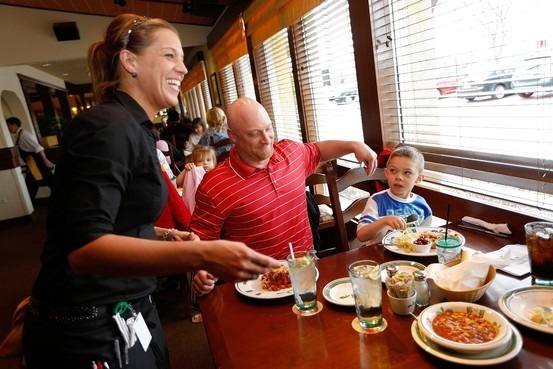 I like to get my tips at the end of my shift because I know what I’m getting right away,” says Tamie Cordoba, a 54-year-old server at a LongHorn Steakhouse in Jacksonville, Fla. The Cheesecake Factory Inc. suggests an 18% gratuity for parties of six or more, says a spokeswoman, but “We advise our guests that leaving a gratuity is always discretionary.” She said the company is now reviewing its policy. The IRS ruling was issued in 2012 to clarify and update earlier tax guidance on tips, which didn’t spell out how automatic tips were to be treated. Restaurants persuaded the agency to delay implementation until next year. Still, the ruling has caused some confusion. Some restaurants insert an amount on the tip line and then remind guests on the check that they are free to adjust that amount up or down. Ms. Dyson, the payroll tax attorney, said that practice could come under scrutiny from the IRS. “How far can you go before the IRS says that looks like a service charge?” Ms. Dyson says. Tags: Gratuity rules, IRS rules on gratuities, Restaurant tips, Wall Street Journal. Bookmark the permalink.